Ambitious plans have been unveiled for a New York rugby league team to follow Toronto into the English game. 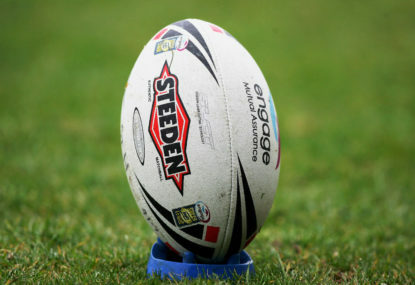 A business plan has been submitted to the Rugby Football League and organisers, who say they have the backing of wealthy benefactors and hope to get the go-ahead in time to enter the competition in 2019. The project has been inspired by the success of Toronto, who achieved promotion from Kingstone Press League 1 at the first attempt and drew crowds of 7,000, but the founders of the New York club hope to get the go-ahead to enter at Championship level, just one step away from Super League. Co-founder Tom Scott told a media briefing in Leeds that, like Toronto, the New York club would not seek any central funding and have already secured $US10 million ($A12.64m) in investment. Like Toronto, New York would cover all travel and accommodation costs of visiting teams after securing agreements with a travel company and hotel chain and play in blocks of home and away fixtures. Organisers say playing in the summer would avoid a direct clash with the NFL and they are confident of building a fan base of 10,000 in the first year, doubling the figure within three years to bring it on a par with the New York Red Bulls soccer team. The team would be based at a training complex in Warwick, an hour’s drive from New York City, and play at the 25,000-seat Red Bull Arena in Harrison, New Jersey, a 20-minute train ride from the World Trade Centre. The development comes in the wake of a pledge from Toronto founder Eric Perez to launch a second Canadian club in the next six months and a prediction that there could be up to six North American teams within five years. The United States will host the 2025 World Cup and the Hawks’ 2017 World Cup captain Mark Offerdahl, who played in New York’s tri-state area for the Connecticut Wildcats, is confident the project can be successful. “There’s lots of potential,” said Offerdahl, who played in the Championship for London Broncos this year. “Rugby union has gone crazy in the last 10 years but they also love rugby league.